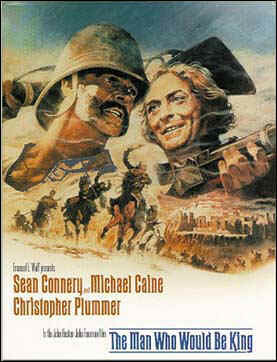 Today, I'm looking at Michael Caine's performance in the 1975 action-adventure film The Man Who Would Be King. Here he is surrounded by Saeed Jaffrey (left) and Sean Connery. This article is part of the Summer Under the Stars blogathon hosted by Journeys in Classic Film. The British actor Michael Caine was one of the great stars of the 1960's. He became an international sensation by playing a ladies' man in Alfie (1966), a secret agent in The Ipcress File (1965) and a small-time hood in Get Carter (1971). Caine was great in all these movies, but there's something special about his performance as Peachy Carnehan in The Man Who Would Be King. He uses his natural Cockney accent to give a sly and quite charming performance as an ex-British soldier on the make in 19th century India. The Man Who Would Be King is a classic action adventure tale in the style of old Hollywood movies like Gunga Din (that film is airing on Aug. 15 as part of the Douglas Fairbanks Jr. tribute). The Man Who Would Be King was a dream project for John Huston, one of old Hollywood's great directors who made classics like The Maltese Falcon (1941) and The African Queen (1951). Huston originally wanted to make it in the 1950's with Humphrey Bogart and Clark Gable, but the movie remained in development for two decades (Richard Burton and Peter O'Toole and then Paul Newman and Robert Redford were linked to the project). Huston finally got the movie made with Caine and Sean Connery as a pair of would-be adventurers who, through sheer dumb luck (and I mean the dumb part quite literally), stumble into becoming rulers of an isolated area of Afghanistan. 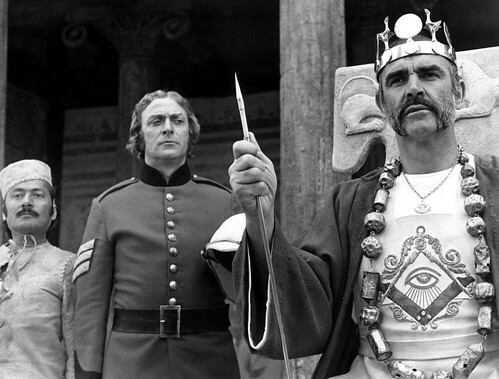 Daniel Dravot (Sean Connery) and Peachy Carnehan (Michael Caine) discover vast riches in The Man Who Would Be King (1975). It was Newman who actually suggested to Huston that Caine and Connery play the Cockney Peachy and his Scottish comrade Daniel Dravot, and his instincts were spot on. Caine and Connery have great chemistry; in fact, Peachy and Daniel are one of the great screen teams, and it's a shame that Caine and Connery didn't make more films together. Connery is fantastic as the dim-witted Daniel (viewers who are only used to seeing Connery as the suave spy James Bond are in for quite a surprise), but the heart and soul of the film is Caine, one of the great movie actors of the last 50 years. Caine is usually the master of understatement -- he's one of those actors that can convey quite a lot while doing very little -- but he gives a broad comic performance in The Man Who Would Be King that relies on his natural Cockney accent. One of Peachy's chief charms is his use of slang phrases like "God's holy trousers" and "I reckon" while running roughshod all over the Middle East. Caine also imbues Peachy with a cheeky confidence that is a joy to watch. Peachy isn't above a little pick-pocketing to pay the rent, and he doesn't blush when informing a British bureaucrat (Jack May) about the finer points of blackmail. Peachy's supreme confidence in himself and his abilities leads he and Daniel into unexpected wealth and power that many wiser men couldn't obtain. Also, both Huston and Caine use Peachy as a subtle commentary on the British rule in India. Peachy believes he is morally superior simply because he is an Englishman: He cheerfully informs the Afghanis that he and Daniel are coming to bring them a better way of life, so "you'll be able to slaughter your enemies like civilized men." 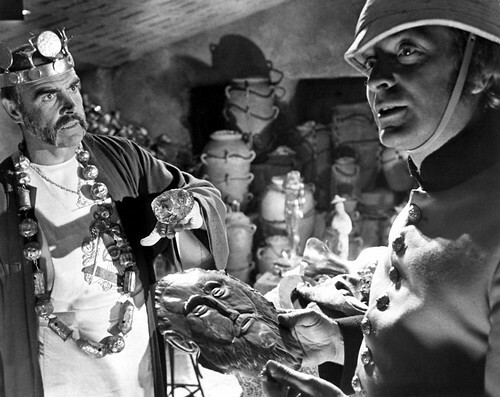 This scene, which features Peachy and Daniel signing a contract witnessed by author Rudyard Kipling (played by a nearly unrecognizable Christopher Plummer) is a good example of Peachy's humor and his misplaced confidence. Finally, Caine's performance is so good because it's so real. Caine grew up in working class London and Peachy's unique way of speaking and cheeky humor are all rooted in Cockney culture. Also, Caine and his family experienced a lot of hardship during the World War II. Caine's family lost their apartment and were placed in temporary housing because of German bombing of London, and Caine has often stated that his drive to succeed as an actor comes from his impoverished childhood. I think that he gives Peachy those qualities as well. Peachy is the ultimate survivor who just keeps chugging along no matter how many obstacles are placed in his path. TCM will air The Man Who Would Be King at 3:30 p.m. Aug. 6. The movie is also available on DVD and video on demand.